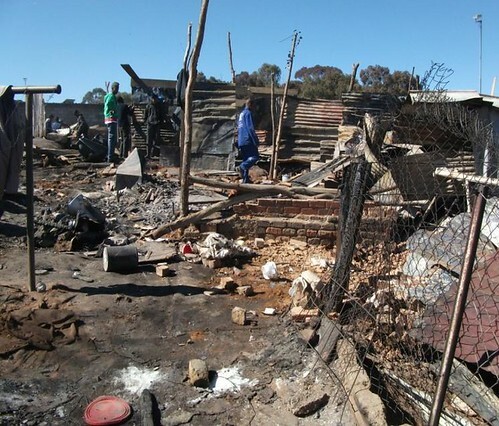 A fire destroyed almost 200 shacks at Slovoville Informal Settlement near Coronation in Johannesburg. There was confusion as to how the fire started. Some people claim that there was an old lady who had left her primus stove burning and it caught fire. Some people say it was an illegal electrical connection. The shacks and all its belongings burnt to ashes. Fortunately, no people were injured or died. The burnt out shacks were flattened. Nothing was left except for a few small items like suitcases. Some people lost everything including ID documents and valuables. The fire started at around 8pm and being at the end of the month, some people were not in their shacks and had gone home (homelands). The City of Joburg’s Disaster Management responded by bringing blankets. The local councillor and the provincial government also responded positively by bringing food for the affected people. The Gauteng Department of Housing also brought building material, corrugated zinc for people to rebuild their houses. Responses were very good from the surrounding community of Coronation. The affected people were accommodated at the nearby Coronation Secondary School. Food was provided for at the Coronation Hall by the local community. When we did an evaluation yesterday, we found that there was no control as some people who were not affected by the fire got blankets ahead of some of the affected people. Some people got corrugated zinc and other building material. These people started selling blankets and building material that had been donated. A single corrugated zinc sheet was being sold for R20. The Gauteng Department of Housing will be bringing additional building material, and they will then check the people who really need this material. Because of the lack of proper organisation, there will be security guards who will ensure that the distribution is done in an orderly manner. We agreed to meet again on Sunday, and when I went there this morning I found that most people were starting to rebuild their shacks, mostly using their burnt material. Most people were complaining that they did not get blankets and building material. I tried to get hold of the local leadership, but it was clear that they were not working as a unit. There were different lists of the victims that did not have the same numbers. I then asked them to try and meet in order to have control and to provide leadership. I promised to keep on checking new developments and that I would also be visiting the area from time to time until everything has been settled.